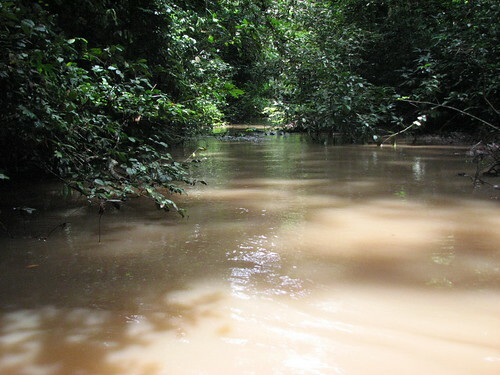 There is a remote forest west of the Lomami and sheltered between the TuTu tributaries that is amazingly rich in wildlife. 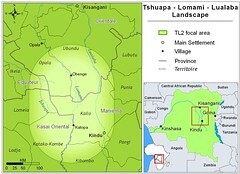 West of the Lomami and east of the Tshuapa, block E15 has amazingly little hunting compared to adjacent blocks of 900 sq km. 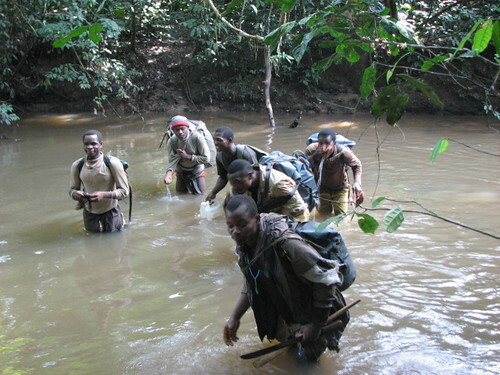 The Tutu bends 90 degrees and the feeder rivers of its basin bend with it, so as Bernard’s team followed the compass line of their transect, they negotiated many difficult rivers. 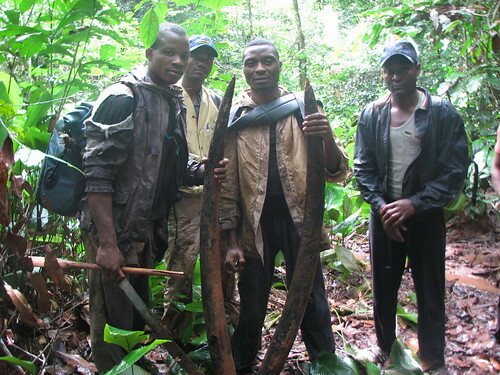 They found a forest rarely frequented by bushmeat hunters: too difficult to be worth it? 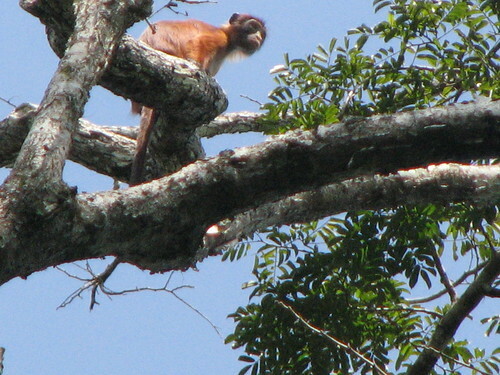 Primates peered from the trees. 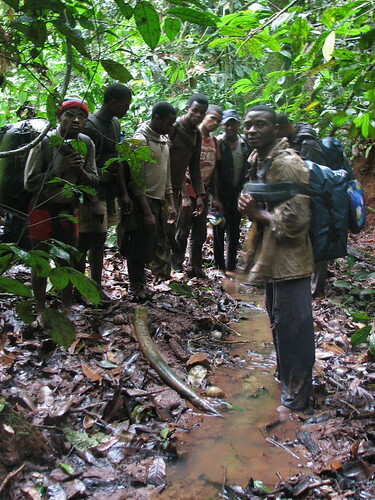 There were bonobo nests, forest antelope, okapi and more sign of forest elephant than they had found anywhere before. Bonobos were feeding here. 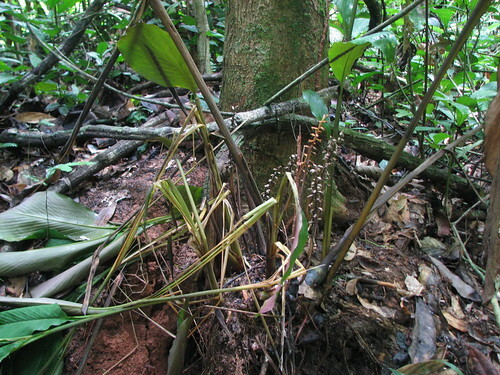 The evidence is the ripped and stripped Marantaceae fronds. 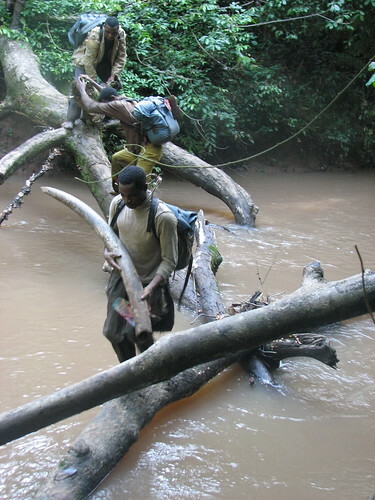 But what made this circuit memorable were the ivory tusks found lying in the mud on the 8th day of the circuit (4 days from the return to Obenge). They had been there a long time, mottled orange like the earth itself and no bones were in sight. 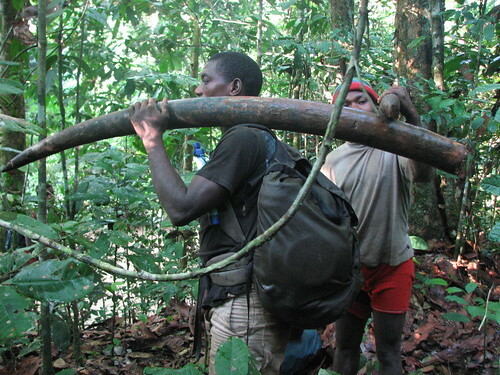 The porters gather round one of the tusks where it lay along their path. Perhaps an elephant, wounded or just old, came to this secluded area to die. 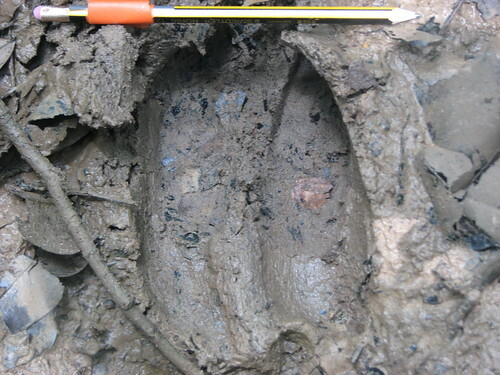 It is not often that ivory is found — anywhere in the wild. Usually elephants are killed, their ivory hacked out, their flesh stripped, and the bones left to molder. 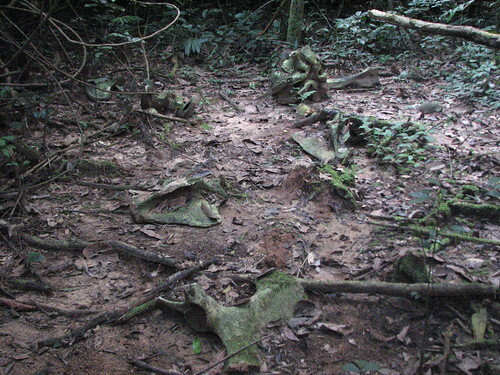 This is the more usual scene of elephant remains found along a transect. There was an elephant slaughter here, more than a year ago, and the ivory was carried away by the poachers leaving the bones to slowly decay. This time ivory was found after the bones were completely gone. Old ivory, but heavy. One tusk was 19 kg (42lbs) and the other 19.5 kg (43lbs). Can you imagine carrying that around like your teeth, day after day !! 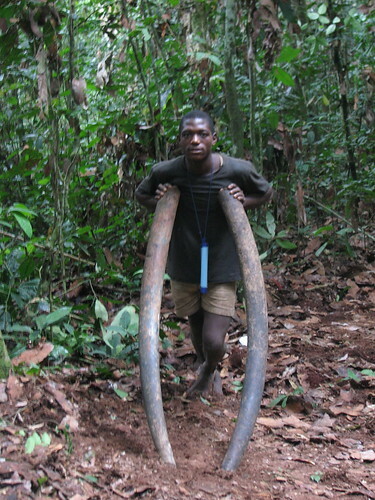 I first wrote about this after the tusks were brought out, Ashley and John told me about presenting the tusks in Obenge, and then in Opala and finally in Kisangani. But now I have had a chance to sit down with Bernard, go through his photos and his account of carrying the ivory back. They were even bigger than I had been told before! The porter Kasidi resting against the two tusks. 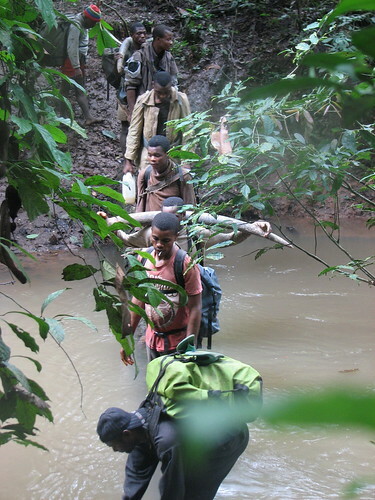 The trail-blazer and observation team were following the compass bearing. Omene with the compass, directing the trail-blazer who is ahead of him. Bernard follows. At the site of the find. Bonne Année is on the left. And so I add the photos below to the previous post about the ivory’s fate. I do so with a special appreciation for the forest and a special awe for its ivory seeking history: The slave caravans of Ngongo Luteta lugging loads of ivory to Zanzibar and, later, the ivory barges of the Belgians shipping more loads of ivory, now in the other direction to the Atlantic. 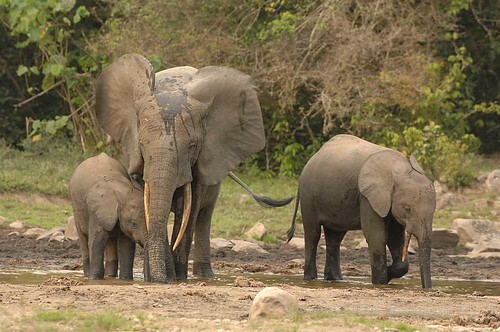 And with a renewed commitment to help assure that elephant will have a place in the basins of the TL2 (Tshuapa-Lomami-Lualaba) carrying their own ivory for many years to come. 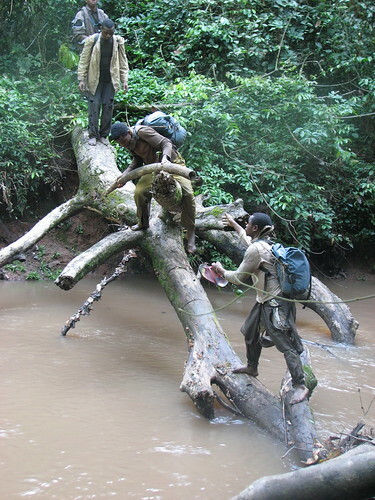 Crossing a stream, now with the ivory. Helping each other with the ivory across a bigger river. This entry was written by Terese Hart, posted on 2008-07-19 at 11:05 am, filed under Elephant. Bookmark the permalink. Follow any comments here with the RSS feed for this post. Post a comment or leave a trackback: Trackback URL. I AM SURE CHINA WILL BE THRILLED TO KNOW THEIR SUPPLIES ARE ENDLESS —UGH! Wow Terese, Terrific post! Did you hear that China just won the right to buy southern African ivory, there are predictions that it will result in greater poaching across Africa. I would like to hear if there is any ivory trading activities in this area. Fascinating post. A wonderfully dedicated and resilient field-team! 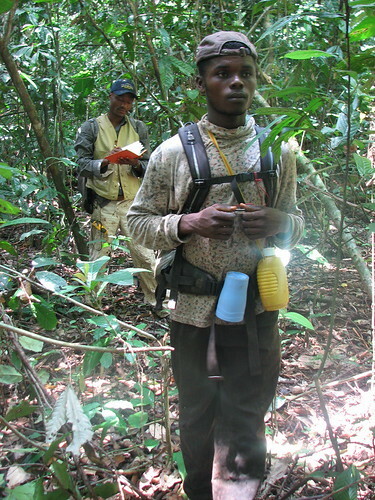 Also a relief to hear of forest “amazingly rich in wildlife” AND “rarely frequented by bushmeat hunters”. Incidentally, I wonder what the western boundary for the Okapi is? I presume they are also on the left bank of the Tshuapa if they get down as far as Lodja? 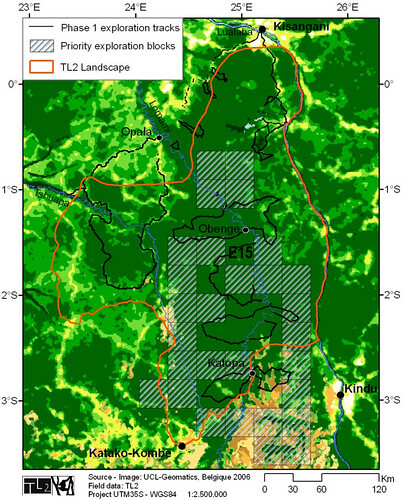 Perhaps the Lomela as the western boundary as there are no records for Salonga NP, right? Or still question marks over that one? I have no better information than you do.Nor is there any historic information that I have found for okapi ever being as far west as Salonga. ?? It could be a change in understory composition, or even forest structure that makes palatable forage rare. ?? But I really don’t know. the tutu is a white water river. Great post, Terese. I’m amazed there’s a place that isn’t heavily poached where elephants can die naturally. It’s also fun that some of the place names you mention are the names of orphaned bonobos at Lola Ya Bonobo. Sheryl, People like bonobo are often named after places. There was an Mbuti who worked for us in the Ituri who was named ZAIRE (!) but more often the name is of the village of their birth…. I guess with the orphans, it is where they were first “acquired”. Great post! Thanks for sharing this awesome, peaceful story…..I too hope that elephants and other animals can come here to die as they wish without being poached! Michael, I’m working on notes from another circuit…further south and west. They are in the tributaries of the Tshuapa: white sands and clear water. Lots of ecological questions remain. I hope we get the chance to pursue some of them! !